We are grateful to the many LIS professionals who have engaged with the University to discuss the reinstatement of Professor Salaita and to reiterate the principles of our profession to Chancellor Wise and others in the University’s administration. This gratitude extends to the many who feel the chilling effects of the University Board’s decision: professors, adjuncts, staff, students, and others who have signed petitions or taken other actions to protect the values of academic freedom at UIUC. Their actions shine light on the path we hope to take together, the path to maintaining a community environment that does not easily fall silent, succumb to uninformed opinions, and rush to reactionary decisions. We hope that other LIS professionals–students, professors, librarians, and more–will join us on the path toward resisting censorship and collusion by signing this open letter. via UIUC GSLIS Students in Solidarity with AIS. My fellow students and I publicly express our grief, disappointment, outrage, gratitude, empathy, and resolve. Most importantly, we show the strength of our commitment to intellectual freedom. We honor the communities of which we are part and the members who have raised their voices already. We write as ourselves, as individuals, as whole people. We do not claim to represent any established University institution, organization, or entity. Please share our open letter widely and join us. My group’s presentation on the current historical moment of diversity and social justice efforts in library and information studies has been delivered. In a previous post, I provided the gist of my part of our group’s presentation, which focused on library neutrality. I was trying to link together several stances: mission/vision creation, professionalism, and library neutrality. In the time allotted to me, I focused on David Lankes‘ Atlas of New Librarianship and the Importance of Activism and Action thread. The central question I posed to the class was “should we be activists?” Is our role as information professionals inextricably linked to political advocacy? I posit that the answers to these questions are yes and yes. Especially if we are serious about the mission of librarians, as Lankes wrote it (“The mission of librarians is to improve society through facilitating knowledge creation in their communities.”). I also think that we can’t achieve a new social compact without political activism and action, the lowest hanging of which would be engaged awareness of one’s positionality in relation to…everything else and everyone else. In the process of researching library neutrality and looking into some of the literature on the topic, I started thinking about the hobby that, so far, was the most engrossing and interesting to me–role-playing video games. How do I link up positionality, neutrality, and role-playing games? All I know is, I wanted to give it a shot, make some sort of connection. 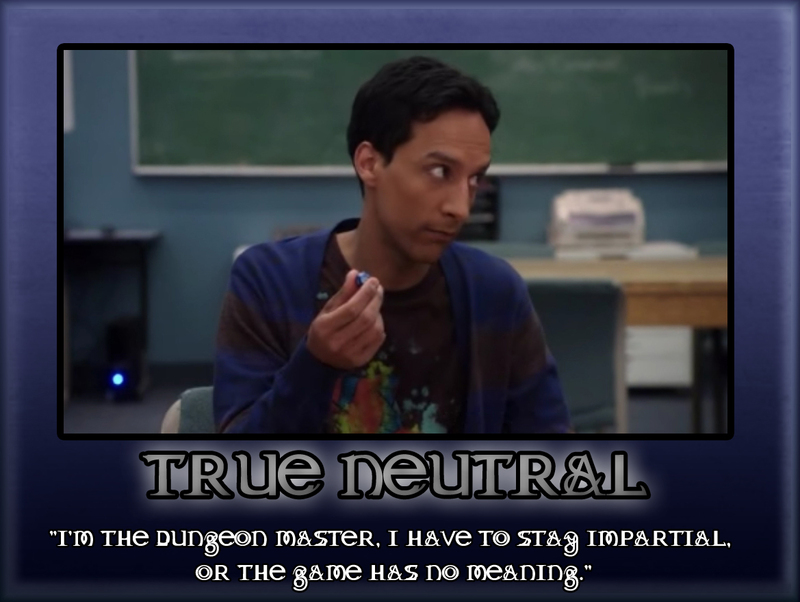 Thinking more about the word neutrality led me to the idea of the true neutral alignment designation, first made popular in Dungeons & Dragons tabletop role-playing games. Is there something to this linking? Am I forcing it? Perhaps. In role-playing games, the true neutral alignment can be thought of has coming from 2 (roughly described) camps: (1) those who don’t really have strong convictions regarding the good vs. evil and order vs. chaos X-Y grid (i.e., see image above); (2) those with strong, complete commitment to balance and neutrality. Role-playing characters who truly do not have strong convictions either way are often transitory. This means they are free to move, or be moved, along the space of the alignment grid towards one extreme or another. The fluidity of such a position is very characteristic. They often see the bigger, systemic picture, the necessity of good, evil, order, and chaos, and may behave in ways that are, ultimately, in favor of their own interests or the interests of the groups and organizations that support them. True Neutrals with commitments to balance and impartiality, on the other hand, make attempts at harmonious existence. No extremes. No judgments. Sounds great, doesn’t it? Yeah, until I remember that this line of thought is also responsible for color-blind racism…but I digress. Please see the image above for an illustration of True Neutrality, courtesy of the Abed Nadir character from NBC’s tv show Community. So…what does this all have to do with library neutrality? The idea that got me to this line of thinking is the transitory nature of neutrality, the position of not being strongly committed to one faction or another. In World of Warcraft, the MMORPG that has absorbed my attention since 2006, contested zones belong to neither faction (i.e., Alliance or Horde). There are neutral places where both factions can exist, sometimes peacefully, sometimes not so. Such zones are contested, belonging to neither faction, having no strong allegiance to those who may be vying for supremacy. With this thought, I thought about library collections, filled with cacophonic voices that stretch our user’s critical thinking faculties. Reference and instructional services, then, are more about critical guidance, transformative and educational opportunities, than mere statistical transactions. It also puts the onus of critical reflexivity on us library workers. It can force us to think about our positions within the organization, think about the social and moral implications of our policies, and examine whether or not we are meeting the goals and principles we say we are committed to. In considering the noncommittal, transitory Neutral alignment vs. the True Neutral position, I do wonder how these ultimately relate to the mission(s) of the profession. It seems to me that there’s a heck of a lot more room for growth and career development in the Transitory Neutral space than in the True Neutral space. And I am very much taken with the idea of the library, its collections and services, as contested zones. Now, what of the True Neutral? Is there a place for such a position within this paradigm of contested zones? I’m not sure. I personally find it very easy to say that there are no true tensions between social responsibility and intellectual freedom, two values we (say we) have in the librarian profession. But… I don’t buy it. Not completely, at least. I think, on the whole, much of the tensions between the two aren’t true binary oppositions. But tensions they still are, in the sense that they present problems that must be solved. I’ve come across many library personnel who have to face the practicalities of being caught in between these two values. The space between is often framed as in loco parentis. Most people expect libraries to be family-friendly, kid-friendly spaces. Heck, we even sell libraries as such. So, when faced with questions of social responsibility vs. intellectual freedom, how do we choose? And how do we choose so that ultimately we are serving our community in the facilitation of knowledge creation and the generation of a new social compact? Very heavy questions. Personally, these are the questions I am asking myself. I’ve made it part of my daily inventory taking. In my capacity as a professional, a human being, and a citizen, I submit that I must exercise my agency. Therefore I must be an activist. I may not go out and demonstrate on street corners and rallies or exercise civil disobedience by chaining myself to a permanent fixture. But I do think that the choice of whether or not to act is upon each of us multiple times a day. And each time, I need to make a choice between my neutrality and my so-called commitments. And since abstaining or refusing to choose is also a choice, I eschew neutrality and, instead, dwell on how such a word is used and by whom. Props go out to my groupmates: Jen Clark and Adam Paradis. Thanks for letting me use our group presentation slides and bearing with my intellectual meanderings. Definitely a shout-out needs to go to our instructor, Dr. Nicole Cooke at UIUC GSLIS. The class is LIS590SJL: Social Justice in the Information Professions. Care to engage? Please do! Write something in the comments section. Book cover: Questioning Library Neutrality, edited by Alison Lewis, 2008. Image from Library Juice Press. It has already been “discovered” by particle physicists, anthropologists, and a range of other researchers, that it is impossible to be neutral. Even if it were possible for me to wash away all influences that sway me in a particular direction, I would not want to achieve that state of neutrality. From a moral standpoint, I have no desire to remain neutral when faced with a choice between science based on the scientific method or science based on theology, and between historical fact or hate speech. To hide behind the idea of “neutrality” in such instances is to be party to promulgating misinformation or worse. We’ll be presenting on Tuesday, February 25, 2014. Got comments for me? I’d love to hear it here. This semester, I am very happy to be participating in a course entitled “Social Justice in the Information Professions.” The class isn’t part of my required/needed courses to fulfill my certificate of advanced study (CAS) in digital libraries (DL). Social justice and service to diverse, underserved populations through programs and community engagement activities are things I deeply care about, professionally and personally. Our class today focused on global development and social justice, as well as community engagement and community-based research. We had a lightning round of article reviews, in which students discussed an article they read outside of class. The discussion needed to be limited to just 2-3 minutes of summary and analysis. The articles had to be about global development, community engagement, community-based research, and/or social justice. They need not be about library services, but all of us opted for some information-related topic. There were a lot of articles cited by my classmates this afternoon that I want to read on my own. As for me, the article I decided to share was on Open Access and criminal justice scholarship, entitled “Open Access to Criminal Justice Scholarship: A Matter of Social Justice.” It was published in 2008 by Allan Scherlen and Matthew Robinson in the Journal of Criminal Justice Education, 19(1), pp. 54-74. The essence of the article is the position of the authors that practices in the scholarly publication world, specifically those that affect the criminal justice scholarly discipline, are not aligned with the principles of social justice. The authors discuss the positions of John Rawls and David Miller, two authors/thinkers who have greatly influenced what we have come to recognize as social justice philosophy and theory. Much of Rawls’ and Miller’s theories rest on principles of fairness and equality. I personally found this discussion illuminating. 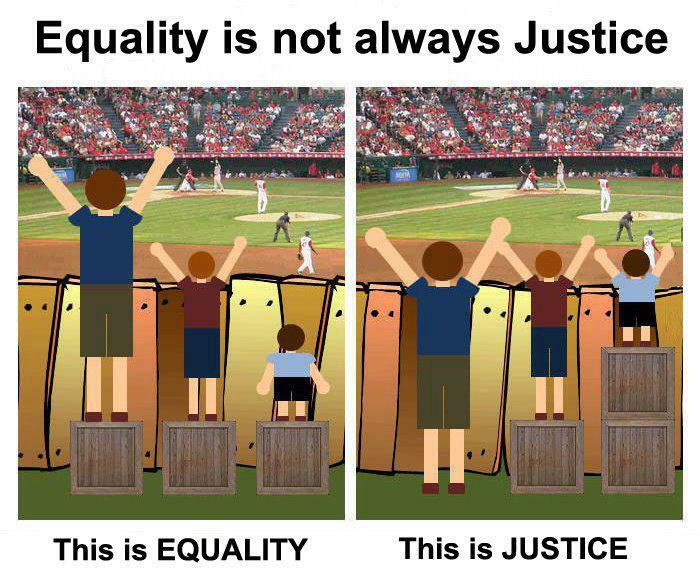 While equality and fairness are principles we can safely assume as important to achieving social justice, Dr. Nicole Cooke framed our social justice course by introducing us to the accompanying image, which states that “equality is not always justice.” They do seem to have a lot in common, but we need to recognize that this is not always so. When are the times that equality and fairness clash with justice? Scherlen and Robinson’s article offers a clue, pointing to an answer to this question. Rawls’ difference principle, and Miller’s need and desert principles, consider the existence of inequality. They just happen. However, Rawls’ social justice theory states that these differences should be skewed toward the benefit of the least advantaged among us. In short, take a look at the image in this post. That. It says a heck of a lot. I feel I have a lot still to understand. But for now, I have come to see that the goal isn’t equality. Not really. Equality is only an attribute, a mark or sign that we look for along the way to achieving the true prize–justice. Have thoughts? I’d love to read them in the comments.